It was a beautiful sunny day yesterday with lots of fresh snow covering everything so I had to share this image with you. There is probably about 20 inches out on the trails. The trails have all been panned and most have been groomed. Big Wood is frozen and ready for the ice fishing season to begin. A great start to our winter season. BTW…snowing again today so no blue sky but it is still pretty. As the winter season approaches, or should I say is here, we want to remind our guests to use our back entrance to the office and lobby during these snowy months. It can be a definite safety issue as snow builds up on the roof and we are never sure when it may slide down. SO it is simply easier to just block off this entrance. 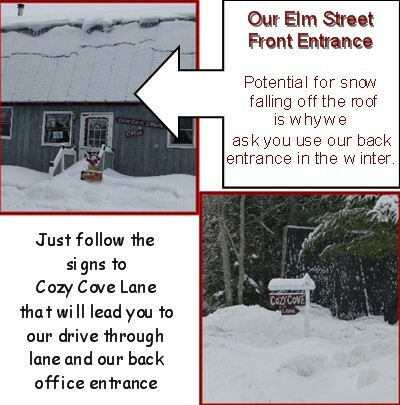 Our drive, or what we call “Cozy Cove Lane” goes through from Elm street entrance to Forest Street so if you have trailers, no problem. 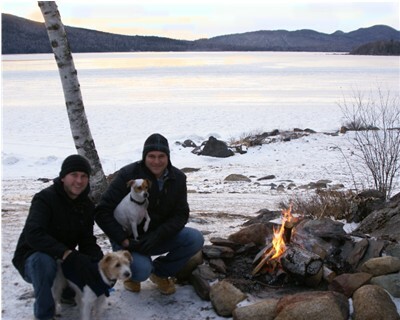 This weekend, a couple of our guests enjoyed a fire to keep warm while they enjoyed a sunny but cold day at Cozy Cove Cabins. 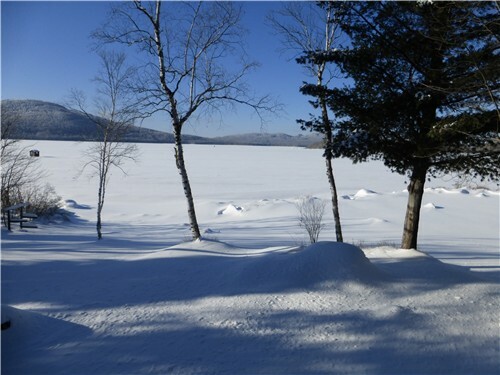 The lake has frozen over, there is a bit of snow on the ground. It will not be long before the winter season will be here in full force. SO get the sleds and ice fishing gear ready!